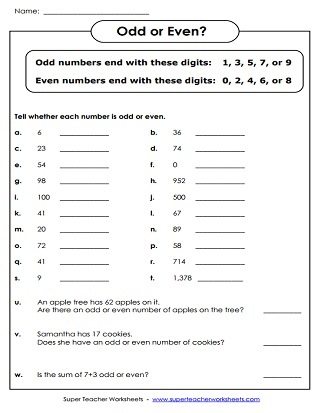 The printable worksheets on this page can be used to teach your students about the differences between even and odd numbers. Tell whether the given numbers are odd or even. Includes a couple of word problems on the bottom. Color only the odd numbers on the grid and you'll make a path to help the mouse find his cheese. 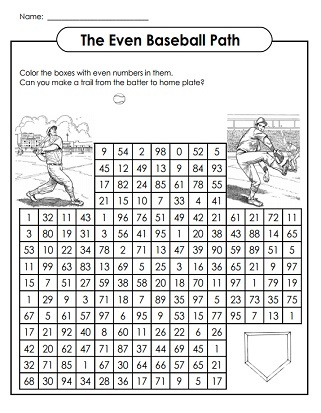 Color the even numbers blue and the odd numbers red. Then, find the number in each group that doesn't belong. On the first caterpillar, fill in the missing even numbers (2-20). On the second caterpillar, fill in the missing odd numbers (1-19). Color the caterpillars according to the instructions. Includes odd and even numbers up to 16. Count the items and tell whether the number is even or odd. Sort the odd and even numbers by playing a matching game, or by sorting the number cards on a table. Skip count by 2s.� Fill in the boxes with even numbers to complete the chart. At the bottom, there is a question about even numbers. 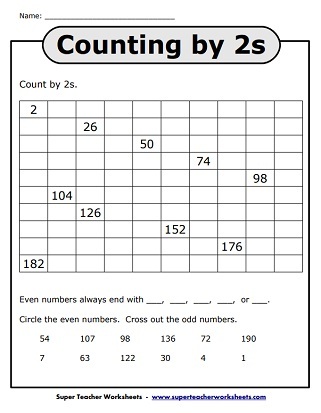 Color the even numbers on the grid. Make a path to help the batter find his baseball. Find the sums for each basic addition problem. Then, tell if the sum is even or odd. A series of critical thinking word problems to help kids differentiate between odd and even numbers. Use the key to decode the secret numbers. Cut, color, and fold the origami cootie catcher (aka Fortune Teller). Then play the game to learn odd and even numbers.